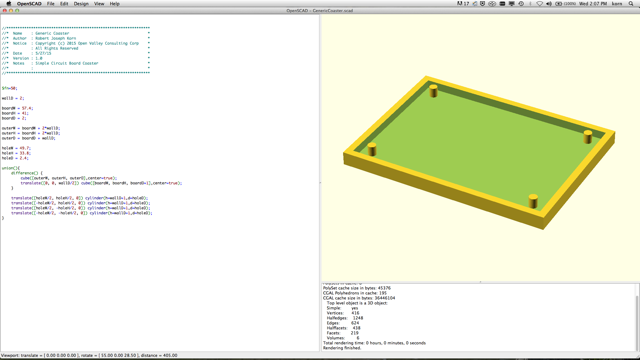 Not every prototype needs a case but sometimes its nice to have some protection for the bottom of the board. I usually just use a scrap of wood. Leftover laminate flooring makes a great base. When the project needs a little more class like my Cypress developer board, I 3D print a coaster. I used SCAD to make a simple coaster with posts to match the board holes. It takes about a half hour for a small one so its reserved for special projects. You can use tin nuts or simply melt the posts to hold the board in place.